Inventory tag with tear off stub, Riverside Paper Co.
Our 1 part Inventory tags have a tear off stub. You can order Pre-wired tags or without wire. 1 part Inventory tags with tear off stubs are sequentially pre-numbered for better control of returns or inventory. 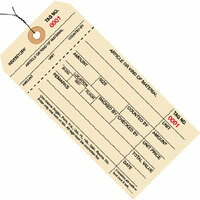 We can custom print inventory tags to your specifications, call for information.